Apartment Museum of Fyodor Dostoevsky is located on the same street and in the same house where he had once lived. 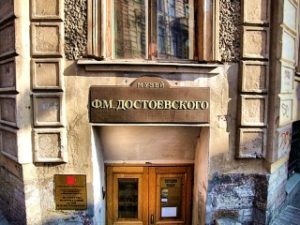 It was one of the first addresses of Dostoevsky in St. Petersburg, here he worked on the story “The Double” and … the last, where he wrote the novel “The Brothers Karamazov” and where on January 28, 1881 the writer had died. Dostoevsky rented apartments in low-cost areas of the city, frequently changed the addresses. He has not lived in any apartment over three years. The friends of the writer, visited his home in different years, always mentioned the ascetic environment, simplicity and restraint interiors. Dostoevsky’s wife, Anna, wrote about the apartment in Kuznechny street: “Our apartment consisted of six rooms, a vast storehouse for books, the front and the kitchen and was on the second floor. Seven windows were looking on lane”. The main room in the apartment was always the cabinet. The main place was occupied by a table, usually placed in the middle of the room. The cabinet was reconstructed from a photograph taken after the writer’s death. It presents the memorial items: there is a pen, a box of medication and a wallet on the table – shelf for papers and letters in the corner, and an icon in a silver frame “Mother of God Joy of All Who Sorrow.” In the bookshelves, there are books that really existed in the library of Dostoevsky. The museum collects them by the lists drawn up by the wife of the writer. The writer’s relatives recalled, that Dostoevsky did not like when something was misplaced in his cabinet – the manuscripts, books, or a chair was shifted from the place where he left it. It was his creative workshop, and no one was supposed to destroy its special atmosphere. In this room Dostoevsky worked on the novel “The Brothers Karamazov”. Here, in this room, Dostoevsky died. Watches belonging to the younger brother of the writer, Andrei Mikhailovich, stopped at the date and time of the writer’s death: January 28, 1881. This excursion is not available on Mondays.